If you love overnight oats, these Lemon Poppy Seed Overnight Oats may just be your new favorite! I can’t thank you all enough for the sweet messages and words of support after sharing the first part of our adoption story. It is certainly no coincidence that I plan to share part two of our journey, the part that takes us to the day we held Sam for the first time, the week of Mother’s Day. For those of you out there that are already getting that pit in your stomach from the anxiety of how you will handle Mother’s Day in just a handful of days, I want you to know I have you on the top of my mind, and so close to my heart. Over the last 4 years since our first miscarriage, Anthony and I have made Mother’s Day a very special, private day in which we hid away for the most part. This is because to us, I was a mom, a mommy, a mother, but to much of the rest of the world or as it appeared, I was not. It was so hard for us. I have been asked several times what I will do for my “first” Mother’s Day and it brings a tug on my heart because this is actually my 5th Mother’s Day, but it’s the first I am recognized as a mother. We have a keepsake box my family gave us for each of our angels, Eli and Josie. Each of them is full of cards, hospital bracelets, books and other gifts friends and family gave us when we lost them. They were tucked away for the past few years and I would usually go through them every now and then when I was having a hard time or just wanted to be reminded of them. Recently I came home and Anthony had been doing lots of organizing and spring cleaning around the house. I noticed that each of the engraved keepsake boxes were sitting out in a special place in our dining room. Seeing them out in the open after years of being hidden away made me feel so comforted in a way–as if now they were there for us to remember not just in random passing, but any time of day. It meant they are a part of this family, and they have a place here, not just in our hearts. It was a simple gesture from Anthony but it literally meant the world to me. I actually ask Josie and Eli to watch over and protect Sam every day. I like to think they are two of his guardian angels (heaven knows this child needs an army with how active he is already!) I know now had we not lost them, there would be no Sam for us as well, so the pain certainly brought along the best gift possible. ———It’s funny, I had only intended to come here tonight to talk overnight oats and suddenly found myself on a whole different path. But there is a reason for this so I will get right to it. This year, on Mother’s Day, I want you to do something for me. I want you to look around. Everywhere you look, there is a woman DYING to celebrate Mother’s Day with a little one in her arms. There is a couple praying that this year will be their turn, their turn for handmade cards, Mother’s Day breakfast in bed, and butterfly kisses. There is the couple who has miscarried and there is the couple who has never seen those perfect double pink lines. They are waiting, hoping and praying for their turn. If you have a friend or relative who has experienced loss, don’t let Mother’s Day pass by without acknowledging them as a mommy. Send them a card, a note, a text, something to say you love them and you are thinking of them. I can’t tell you how much that meant to me when friends and family did so for us. If you are unsure of someone’s situation, just be sensitive as to what you may say around them–try to avoid asking when they are going to start a family or anything along those lines. This year, take the time to remember and send a prayer of hope for those on the other side of fertility. They may not have a baby in their arms, but these women going through hell to bring home a bundle are already more of a mother than they know. Mother’s Day won’t be easy for everyone, but with a little extra love and support, it can go a bit smoother and help those who need the extra love the most. Three Words: Lemon. Poppy. Seed. We all know I love all things lemon, but lemon poppy seed may be the only thing that can one up my other fave combo: lemon and blueberry. When I was in high school, I worked at a local coffee shop. A local baker made lemon poppy seed bread with this sugary glaze on top and it was the most popular baked good on our menu. The best part? We didn’t sell the end pieces to customers so that is what all of the staff got to munch on for free. Talk about a big win! 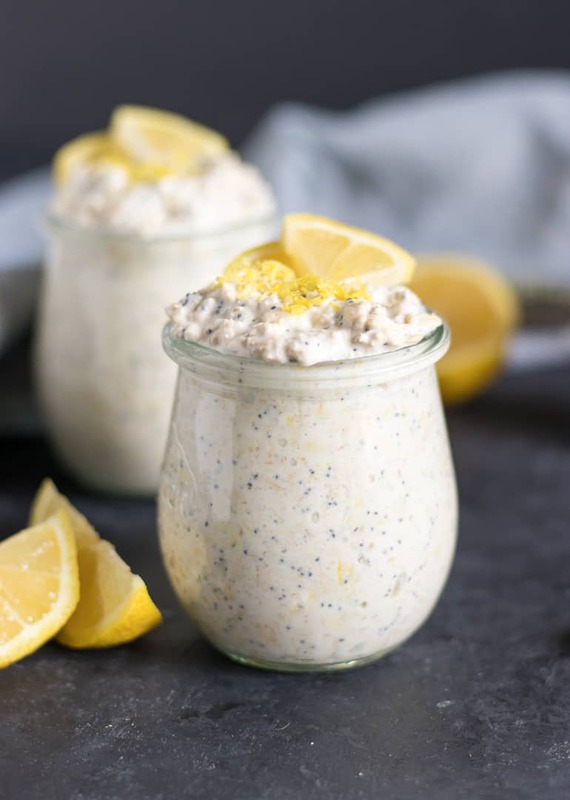 It was the first time I think I ever had lemon poppy seed anything and I was sold for life. Recently, I was noticed that this very flavor was missing from my list of Overnight Oats flavors. That had to be remedied immediately of course! As far as overnight oats go, it’s fair to say that I have waaaaaay too many versions on the blog. However, every time I survey readers, I hear the feedback that they still want more overnight oats. So I gotta give you guys what you want, and what I love! 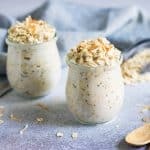 These are only a few of the long list on the Overnight Oats page so check them out! As for this lemon poppy seed version, I switched things up. 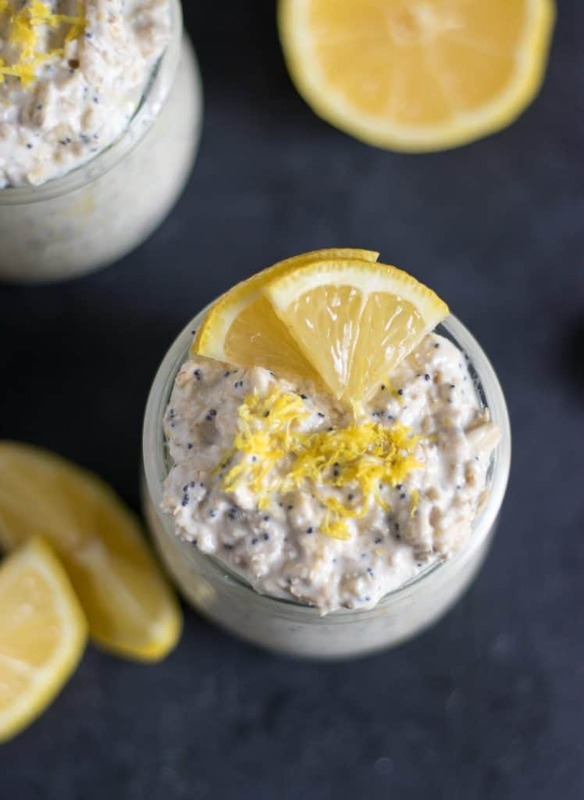 I typically don’t add yogurt to my overnight oats, but lemon yogurt in these was a must. If you need a dairy free yogurt, that will work fine. I still suggest using lemon, but that may be hard to find so you could also go with a vanilla. I also thought I was going to prefer these chilled versus warmed up but I really did like them warm just like I always eat them. They are great with some fresh berries on top as well! This looks so delicious! 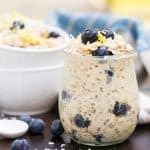 i love overnight oats and will definitely need to try this recipe! Thanks for sharing! Love this! I pinned it for later! Thanks Rachel! Hope you love it! 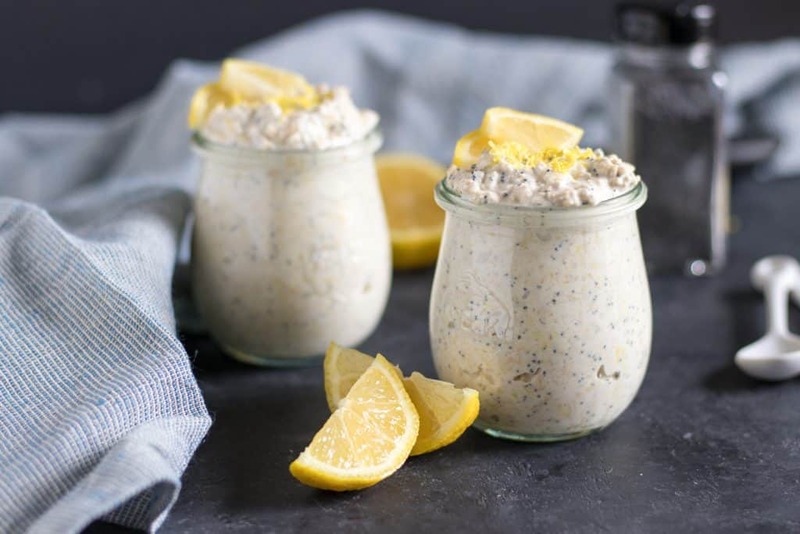 I’m always on the look out for new overnight oats recipes and this one looks fabulous! 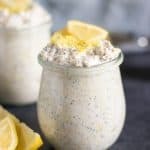 I love Siggi lemon yogurt and it would be perfect for this! Okay this sounds amazing!! I love lemon poppyseed everything! Giving this a try this week! Enjoy Kelsey! It’s my new fave!